Whoever was in charge of writing cute little biographies for the Kreons has been falling down on the job ever since Series 1. Given Hasbro's stellar track record with the Fury Files and Iron Man Card websites, we'll surely be seeing all those delinquent bios showing up any minute now. Until then, we're left to extrapolate on our own: Nemesis Prime loves punching Autobots so much that he's just going to be doing this: [windmills arms] If any of his fellow Decepticons get hit, it's their own fault. Naturally, Nemesis Prime is basically the same as Optimus Prime - even in the original fiction he's literally just walking around in a repainted Optimus body. Of course, since the Optimus Prime I have wasn't quite standard, this is more than a repaint to me. 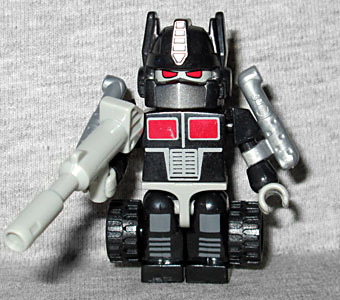 He has the smokestacks on his arms and the traditional Optimus helmet, though his eyes are red behind the silver mouthplate. His chest is printed with the truck windows and grill you'd expect, but he gets apps on his legs that Optimus didn't: panels on his thighs and vents on his shins. Naturally, he shares Optimus' gun. What he doesn't share with Optimus is the ability to change into a truck. Wait, that sounds backwards. What he doesn't share is the inability to turn into a truck, because he can, while Optimus can't. You just lay the robot down, remove his head, and plug the cab of a truck on there (built from four blocks with a tampo for the windshield), but there is no denying that it is probably someone somewhere's idea of what a truck might look like. 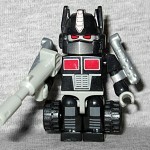 Thanks to the codes on the Micro-Changers bags, I was able to find Nemesis Prime easily. I don't care if he's not a very good truck, he's a black Optimus Prime, and sometimes that's enough.